I have a confession. Since moving here I have become a bit of Twitcher. To clarify for any of you not familiar with the term, it’s a colloquialism for bird watcher. Mr Incredible gleefully insists that this is middle age trumpeting, hooting and twittering its’ arrival. Not so, say I, just one of the boons of living in South Africa. We live a hop skip and a warble from a small nature reserve and if you are up at sparrrow’s fart or go at dusk the bird life is quite phenomenal. 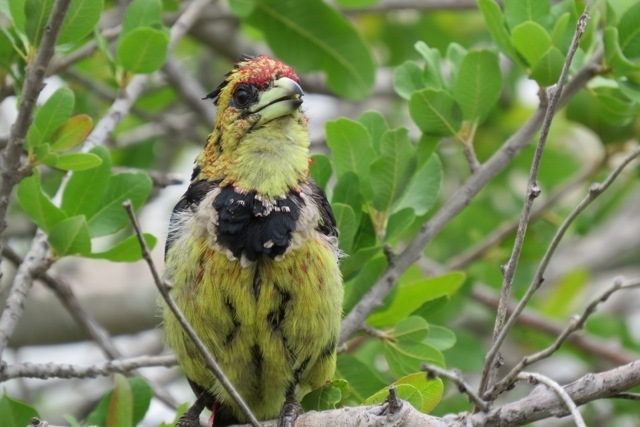 We’ve seen a Crested Barbet, astonishing numbers of crimson jacketed Southern Red Bishops flashing bright between the reeds, sleek Cape Glossy Starlings shimmering like peacock feathers and Red-Collared Widowbirds lumbering up and down battling the weight of their over-long tails. A flap and a feather away we have Montecasino Bird Gardens where the daily ‘Flight of Fantasy’ show showcases parrots, toucans, a tiny owl and a rock star of a pelican. The South African Hornbill is their preservation poster bird and Russell (the) Crow will whisk any paper money donations from your fingertips and post them in the collection box. If you blink, you miss it. A mere swoop and a peck away in our very own back garden we have a number of regular visitors. First there are the Hadedas. We heard them before we saw them with their brash ‘hada-hada’ call. Essentially shy, they are large grey birds – similar to Curlews’, strange and ugly-beautiful. They have scythe shaped beaks a slightly awkward gait and flappy take-off.We often have up to four of them in our garden at breakfast time and again in the early evening. As an added bonus, they aerate our lawn when boring for worms. The common Grey Loerie birds with their Mohicans and long tails have a distinctive cry “Away, go away” and are hence also known as Go Away Birds. Twice I’ve heard the Loeries going berserk in the big tree in our garden; both times it was due to the presence of a Spotted Eagle-Owl. I wondered whether they were sticking close to the owl for protection. In fact, joined by a variety of other small birds, they were actually working the safety in numbers rule. The weaker birds taunt the predatory one, hoping it will fly away. It’s called mobbing. 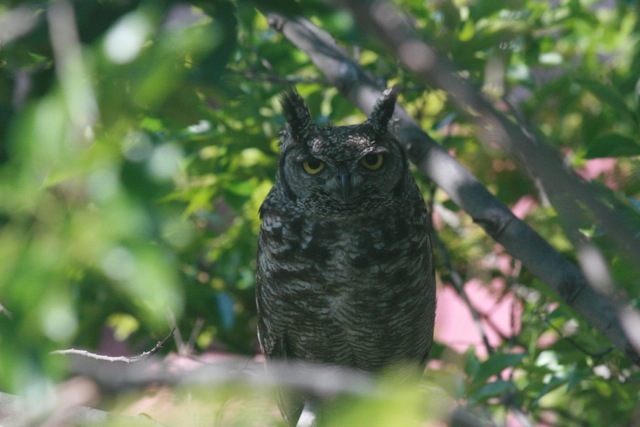 The owl showed complete disdain for the racket and spent the entire day in the tree tracking me with its bright yellow eyes as I moved around the house. My favourite visitor is probably the little Weaver Bird. 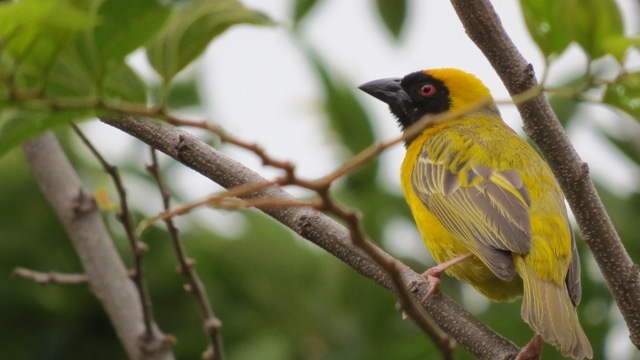 The male Weaver is small and golden mustard and highly skilled at nest weaving. The paler female weaver is an extremely high maintenance chick. Her suitor will build her a lovely nest, a beautifully woven teardrop shaped bauble. But when she inspects it, she’ll say – “But Dora next door has a conservatory.” So her suitor demolishes it and builds a better nest in its place. “Oh, but wouldn’t it be nice to have an en-suite”, she’ll sigh wistfully, the moment he finishes. Again, her suitor diligently demolishes and rebuilds. “If you reeeeeally loved me, you’d weave me a penthouse”. This process continues until she is finally satisfied. In the case of weavers, birds of a feather really do flock together and result is trees decorated with pretty nest baubles. To parrot the Loerie, I shall now “away, go away” and leave you to your day. Great, really enjoyed reading about SA birds. Thanks! The bird life here really is phenomenal. 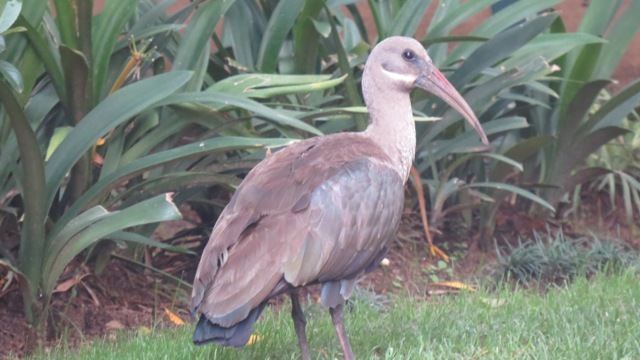 Nothing to do with middle age (and I should know)…….just being gobsmacked at the beauty of South African birds……..and on your doorstep too. But I’ve just seen a kingfisher by the Bourne Hall pool on the busy traffic side! No kingfisher sightings here yet, but I did finally spot the Dragon (giant monitor lizard) today while I was out walking the Cheese Thief.